Review: Henry Franks is a strange boy. He’s lost most of his memory, dreams of a girl calling him daddy, cannot feel physical pain, and has rings of scars around his neck. Understandably, Henry wants to find out more about himself, his family and so on. With his kind of girlfriend Justine, he sets about uncovering family secrets, as a hurricane builds and a serial killer is on the loose.The mention of mysterious scars was what drew me into this. Around the neck. I really don’t get how anyone can be that badly injured around the neck and survive. 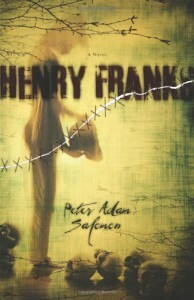 Then I started reading Henry Franks, and found a lot more than that to enjoy.Henry is a very intriguing character. His dreams and his scares kept you interested, because there’s so many possible explanations and there’s lots of little revelations throughout that heighten the mystery. I really liked Justine because she’s smart and understanding, but I would have liked to see her develop a little more. William, the father, is a reclusive character with a LOT of secrets that get uncovered at the climax.The ending. Oh my gosh. All the revelations. I can’t tell you what happened but it was one of the most amazing chains of events that I’ve read for a long time. it’s very improbably, and it’s one of those stories that you really have to suspend belief as to what is possible and what isn’t (a slight shock after a fairly realistic story where there horror is more psychological). And I highly doubt anyone would have seen it coming.Or maybe it was just me being thick. The names! They should have been a bit of a giveaway, but there were enough other thing to put you off the scent. It’s really good storytelling.The narration to star with seemed a bit detached, but I soon got used to it and really attached to the characters.I enjoyed the development of the serial killer storyline. My first read of Henry Franks was with the Netgalley copy, which made it hard to pick it up (my kindle didn’t handle it very well) but reading the physical copy made me get how the suspense around the killer built up well. I especially like the fact that this storyline intersected with Henry’s family story.Overall: Strength 4 tea to a really good novel with roots in another of my favourite books, but a fresh perspective on it all.